Propagation last weekend was difficult on Saturday, especially within North America. Fortunately, it improved by Sunday. 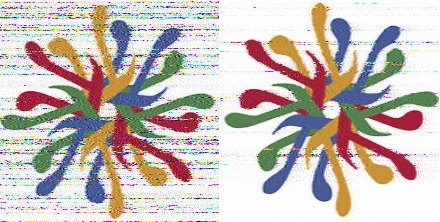 If you are new to the program, note that Fldigi automatically saves decoded images as png files in the folder \fldigi.files\images\ probably within your C:\Users hierarchy. Operating systems other than Windows may have different folder names. When sending reception reports, please attach those png files. VOA Radiogram this weekend is all in MFSK32 except for the new VOA Radiogram transmission schedule in Olivia 64-2000 under the closing music. The only frequency change is Saturday at 0930-1000 UTC: 26 March is the last day for 5865 kHz; effective 2 April, 5745 kHz will be used during that broadcast. Olivia 64-2000 transmission schedule under closing music. Thanks for your reports. I’m now compiling the gallery from program 153 and will try to begin sending them out this weekend.